The Drager Pac® 8500 single-gas detection device is a reliable and precise instrument even under the toughest of conditions. The device can be equipped with a hydrogen-compensated CO sensor or a Drager dual sensor. 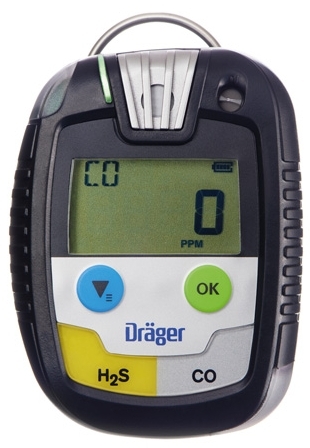 This gives you the option of measuring two gases at once: either H2S with CO or O2 with CO.
Strong performance for maximum safety - You can count on the Drager Pac 8500 to give you reliable, precise readings at any time even under extreme conditions. Our powerful sensors with a low t-90 response time ensure quick reactions. In addition to the standard alarms, you can define extra alarm thresholds for TLV®* and STEL*. The Pac 8500 also provides a data and event logger for logging concentrations and events along with the date and time. The data can be loaded on a PC via an interface and processed further there. Convert to two-gas detection device using a dual sensor - Your single-gas detection device can become a two-gas device when a dual sensor is used. The Drager Pac 8500 series offers the following sensor combinations: hydrogen sulphide with carbon monoxide or oxygen with carbon monoxide. Dual sensors enable detection of even low concentrations - and all in one and the same handy device. Measuring two gases at the same time reduces downtime as well. You can take vol.% measurements of oxygen and ppm measurements of carbon monoxide simultaneously using just one sensor. Measurement of carbon monoxide with significantly reduced cross sensitivity - In industries where carbon monoxide needs to be measured with hydrogen as a background gas, the measured value for carbon monoxide may be falsified by cross sensitivity. Thanks to the special hydrogen-compensated CO sensor from Drager, this cross sensitivity to hydrogen is significantly reduced in the display of carbon monoxide. Robust design - even for the toughest conditions - The Pac 8500 can easily handle even extreme conditions. The sensors can tolerate air pressures between 700 and 1,300 mbar. A membrane filter protects the sensor from foreign matter such as dust and liquids. The shock-proof, chemical-resistant housing meets the requirements specified in the IP68 standard rating. Easy handling thanks to clear user guidance - The D-Light indicates whether functionality of the device has been tested and if it is ready to use. The housing is also designed with your safety in mind: each sensor variant of the Drager Pac 8500 features clearly visible colour coding, thereby minimising the chance of mistakes. User-friendly display with all important information - The large display is word-free and clearly indicates the respective gas concentration. Other important information, such as the unit of concentration and battery capacity, is also displayed. The bright backlighting ensures that all values are clearly legible in the dark. 360° alarm with various functions - If the Drager Pac 8500 measures hazardous gas concentrations, it sets off an audible, visual and perceptible vibrating alarm. Two bright, flashing LEDs on the top and bottom of the device ensure that the alarm is easily visible from all sides. The acoustic signal reaches a volume of 90 dB. The display can show the peak concentration measured at any given moment. Earlier alarms registered can also be retrieved at a later time even if they have been acknowledged. The Pac 8500 with oxygen sensor has two additional alarm thresholds in addition to the standard alarm threshold settings. Economical operating costs - All of the versions of the Drager Pac 8500 are equipped with extremely durable DragerSensors® and a powerful battery. The Pac 8500 is protected against water, dust and other foreign bodies by a special membrane filter. When the filter becomes heavily soiled in use, you can quickly and easily replace it yourself. The device is then ready to use again right away. Thanks to the powerful battery, the Pac does not require charging on a daily basis and is easy to handle. Fast function test saves time and money - Function tests and calibrations can be carried out especially efficient in the Drager X-dock® calibration station. The automatic bump tests in the X-dock are a cost-efficient and convenient solution thanks to the short test duration and the extremely low consumption of test gas. The Pac 8500 is simply placed in the bump test station and automatically selects the correct setting.